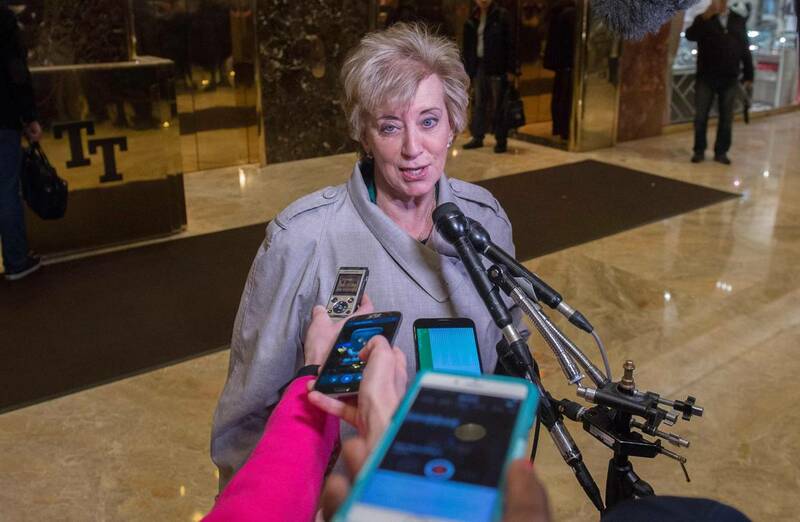 Linda McMahon, President-elect Donald Trump’s pick to run the U.S. Small Business Administration, once supported a plan that could have eliminated the cabinet seat she is now slated to hold. Ms. McMahon, a co-founder of World Wrestling Entertainment Inc., twice unsuccessfully ran for a Senate seat in her home state of Connecticut. As part of her 2012 campaign, her economic plan called for getting rid of “outdated/ineffective and duplicative programs,” and expressed support for a 2012 proposal by President Barack Obama to merge the SBA, the Commerce Department’s core functions and four other entities into one unit . A spokeswoman for Ms. McMahon, 68 years old, declined to comment on any issues related to the SBA before confirmation hearings. As head of the SBA, Ms. McMahon would oversee an agency with a budget of more than $10 billion that last year approved more than 70,000 government-backed private-sector loans. The SBA also provides mentoring and counseling, and oversees federal disaster-relief programs. Ms. McMahon and her husband, Vince, bought his ailing father’s wrestling business in 1982 and took the company public in 1999. The WWE, which had $659 million in revenue last year, grew by developing a cast of larger-than-life chiseled villains and heroes who seemed drawn from comic books. Since stepping down as chief executive in 2009, Ms. McMahon has turned her attention to politics and to promoting women’s leadership and entrepreneurship. The couple still own a controlling stake in WWE, where Mr. McMahon serves as chairman and CEO. Ms. McMahon initially supported New Jersey Gov. Chris Christie’s Republican presidential bid, but gave $7 million to super PACs backing Mr. Trump late in the campaign, including a $1 million donation a month before the election, according to federal election records. The McMahons also were large donors to the Trump Foundation, according to tax records. Ms. McMahon ran two of the most expensive U.S. Senate campaigns in American history. She spent about $100 million combined, mostly from her personal fortune, but lost to Connecticut’s longtime attorney general Richard Blumenthal in 2010 and then-Rep. Chris Murphy in 2012, both Democrats. In her 2012 campaign, Ms. McMahon pitched herself as a job creator and called for reductions in federal spending. “If a program is effective and needed it will continue; but if it is not, it should be revised or canceled,” according to her campaign literature. President Obama’s proposal to combine the SBA with other entities “really never gained traction,” said Tony Wilkinson, president of the National Association of Government Guaranteed Lenders. “I think there was a concern that it would get buried in the Department of Commerce and that small-business issues needed their own agency,” he said. The trade group, which represents lenders who make SBA-backed loans, is looking forward to working with Ms. McMahon, Mr. Wilkinson said. Moreover, her platform included cutting the top business tax rate to 25% from 35%, allowing businesses to deduct 100% of capital expenses. In addition to her political activities, Ms. McMahon has focused on moving women into leadership positions, an area some familiar with her work believe will be a priority at the SBA. Ms. McMahon is the co-founder and chief executive of Women’s Leadership Live, a two-year-old startup that focuses on leadership opportunities for women. Sessions for a conference held in Salt Lake City in October included “Thrive Through Disruption” and “Owning Your Impossible and Learning to Fly,” plus a “Shark Tank”-like business pitch competition. Ms. McMahon also was a major donor to the Women’s Business Development Council in Stamford, Conn., which provides training and education to business owners, and hosts two SBA programs aimed at women business owners. Ms. McMahon’s business record became an issue in both of her Senate campaigns. After a complete list of her creditors from a 1976 bankruptcy filing was published in a local newspaper during her 2012 bid, she paid off the earlier debts. In 2010, Ms. McMahon bungled an answer about the minimum wage at a press conference during that year’s Senate race. Opponents, including Democrats and labor unions, accused her of being out of touch with workers.